I’m really excited about going to this wine tasting next Tuesday! 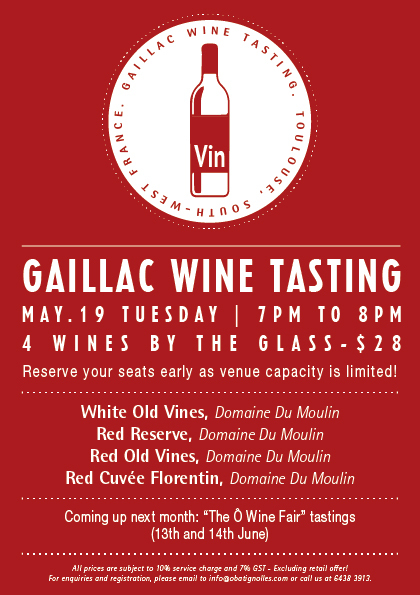 The Gaillac wine tasting event introduces 4 wines from Domaine Du Moulin. Established in 1827, Domaine Du Moulin cares for 30 hectares of vines, a mix of native grapes such as Braucol and Maussac as well as Bordeaux varietals. This is a family operation from top to bottom—Nicolas in the cellar, father Jean-Paul in the fields, and mom Dominique pouring samples for guests, those who find themselves luckily lost along those wandering back roads of southwest France. The best part is that the owner of Ô Batignolles will be hosting the tasting session, so you can be sure he’ll be able to teach you a thing or two about these wines! What: French Wine tasting hosted by ANTOINE ROULAND, owner of Ô Batignolles! it’s $28++ per person for 4 wines by the glass.